Regulators worldwide are moving to protect Internet competition in ways that some critics fear threaten innovation and the Web’s libertarian traditions. Under U.S. government scrutiny, Comcast and Time Warner Cable in April dropped plans for a $45.2 billion merger that would have given the new company control of 57 percent of high-speed Internet access and 30 percent of pay television in the United States. 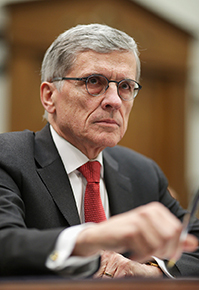 In February, the Federal Communications Commission (FCC) required high-speed Internet service companies to treat all content providers equally and voted to overturn state laws restricting city-provided Internet access. Businesses and Republican lawmakers filed lawsuits and introduced legislation to overturn the FCC actions. In Europe, regulators charged Google with skewing search results to favor its own business and hampering innovation and consumer choice. The Federal Communications Commission (FCC) in February promulgated net neutrality rules that require high-speed Internet service providers to treat all content providers — such as Netflix and Google — equally.